Lock in a great price for Holiday Inn - Hamburg - HafenCity – rated 8.9 by recent guests! The hotel was in a great location of Hafen City, with a quick 20min walk to the Old town. The check-in was smooth, even though the staff were still not sure if the room was ready at 4pm. The room was lovely and specious, and as requested, quite. The breakfast was lovely, with a nice selection and everything tasted divine. A new clean hotel with small rooms. With an underground station close by. Very nice hotel to stay in. Location good for Metro & Bus. Room was very quite. Cleaning of rooms excellent. Some Taxi drivers did not know of the hotel? Very convenient for my needs, modern and comfortable with a good ambiance. New hotel with great facilities, good location, very good breakfast! The bar was fine as well. Good water pressure in the shower, very new and clean interior, comfortable bed. Very clean, friendly staff, it was a very pleasant stay ! Holiday Inn - Hamburg - HafenCity This rating is a reflection of how the property compares to the industry standard when it comes to price, facilities and services available. It's based on a self-evaluation by the property. Use this rating to help choose your stay! 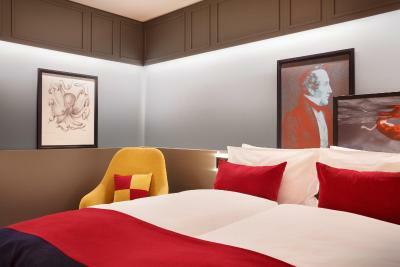 This stylish new hotel is located in the vibrant HafenCity district of Hamburg. It offers free WiFi, a 24-hour business center and a 6th-floor gym with great views of Hamburg. 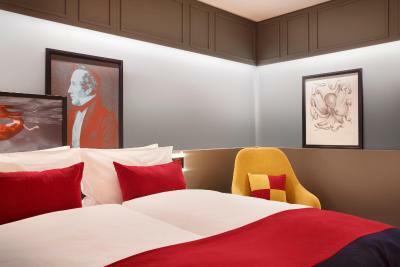 Holiday Inn - Hamburg - HafenCity offers contemporary-style rooms and suites. Each room includes individually adjustable air conditioning, a 43-inch flat-screen TV, a desk, high-quality bedding and a pillow menu. Suites also offer a living area, bathrobes, slippers and a complimentary mini-bar. Guests can relax and check their emails in the open lobby, which also contains a café as well as a restaurant serving regional German and modern European dishes. Room service is available 24/7. 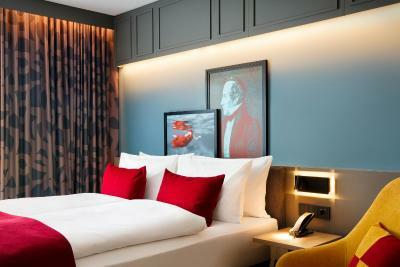 Holiday Inn - Hamburg – HafenCity is within walking distance of the River Elbe, the Speicherstadt warehouse buildings, the stunning Elbphilharmonie. Local busses and the nearby HafenCity Universität Underground Station provide good connections to all of Hamburg’s main attractions. On-site parking is available for an additional charge. Hamburg Airport is 35 minutes away by public transport. HafenCity is a great choice for travelers interested in architecture, restaurants and food. When would you like to stay at Holiday Inn - Hamburg - HafenCity? Air-conditioned, contemporary-style suite including a flat-screen TV, free WiFi and a private bathroom. The suites also offer a living area, bathrobes, slippers and a complimentary mini-bar. Air-conditioned, contemporary-style room including a flat-screen TV, free WiFi and a private bathroom. This room offers full mobility access with a roll-in shower. Hotel surroundings – This neighborhood is a great choice for travelers interested in architecture, restaurants and food – Check location Great location - show map Guests loved walking around the neighborhood! House Rules Holiday Inn - Hamburg - HafenCity takes special requests – add in the next step! Holiday Inn - Hamburg - HafenCity accepts these cards and reserves the right to temporarily hold an amount prior to arrival. It's a bit in the middle of nowhere for the time being. This part of town is under development. Fortunately there is a new subway station nearby. Brand new hotel, well furbished. Good breakfast. Kind receptionists. The food. Breakfast was ok, no better. But the evening meal was awful. I would stay there but not eat in again. 1.We found other people's hair in the room and in the bathroom. 2. A very strange feature: we had to choose between either a room with a shower and a double bed, or a room with a bathtub and two separate beds. Why was there no rooms with a bathtub and a double bed?! We were offered to pay €50 extra per night if we wanted both. 3. One of the coffee cups in the room was not washed when we checked in. 4. There could have been more towels per person. 5. Really weird posters in the room. One of them depicted a drowned woman. Creepy. Upon check-out a taxi was requested to the Train station. As there was a big fair in the city, taxis were limited on the morning and I ended up walking to the train station with my entire luggage. This could have been avoided by informing upon check-in or by ensure taxis would be available in an area with little traffic. Disappointing end to the stay but would return to the Hotel. Only had powdered milk and the tea coffee was not filled up every day , had to keep asking at reception. Extremely comfortable rooms , very clean , lovely big shower . Breakfast was excellent , fantastic choice hot and cold . Dining room service was total unconvortable one night. Only one person at 10 am at the front desk when everybody wanted to check out. There was not fridge or Safe in the room. Everything else was very good. Only English channels on the TV were News channels! Not that we look at much TV. Breakfast seems like a good selection but a little pricey, bathrooms are fairly small. I prefer laminated floors rather than carpeted.